Lucky bamboo is, in fact, not bamboo. It is a type of water lily. It is also a tropical plant and will not do well if temperatures drop below 50 degrees Fahrenheit. If you live in a place where temperatures drop below 50 degrees in winter, you may need to bring your lucky bamboo in for the winter. Although lucky bamboo is not generally an outdoor plant, with proper care and site selection, you can grow bamboo outside during warmer parts of the year in many places. Lucky bamboo will grow in all United States Department of Agriculture (USDA) Hardiness Zones as long as you bring it indoors when nighttime temperatures will be below 50 degrees. It will not survive winter outdoors in any USDA Hardiness Zone because winter temperatures in the warmest listed zone, Zone 11, can still drop to 40 degrees. Select a location for your lucky bamboo. Lucky bamboo is sensitive to direct sun and needs to grow in full shade. Place an inch or two of sand or gravel in the bottom of your outdoor container, if you are growing the plant in a container. If you are planting it in an existing pond that has sand, soil or gravel on the bottom, you do not need to add sand or gravel. Remove the lucky bamboo from its original container or bag. Some sellers place the roots of lucky bamboo in a plastic bag filled with water for transportation. Place the roots of the lucky bamboo 1/4 to 1 inch deep in the sand or gravel. Fill the container with water, if growing in a container. Make sure that the roots and at least the bottom inch of the stalks are covered with water. You do not need to fill the container to the brim. 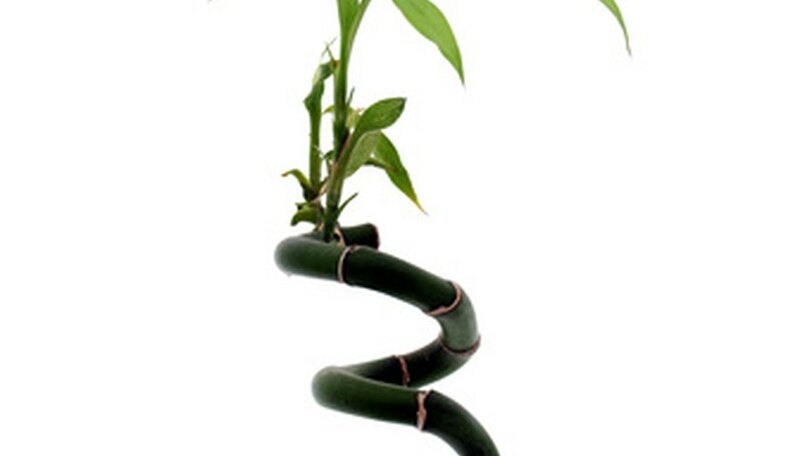 Use a drop of two of aquarium fertilizer when growing your lucky bamboo in an outdoor pot. Use as directed on the bottle for growing in a pond. Because of its sensitivity to cold and sunlight, lucky bamboo is often not recommended for cultivation outdoors in North America. If you decide to try growing the plant outside, be sure to bring it indoors before temperatures drop below 50 degrees.